Marshall Goldsmiths statement, ‘what got you here, won’t get your there’ reminds leaders of the need for ongoing assessment and honest feedback in order to continuously improve and lead effectively. Emotional resilience is about processing emotions more effectively from a place of deep self-awareness, intentionality and purpose. Emotional Intelligence is a set of emotional and social skills that influence the way we perceive and express ourselves, develop and maintain social relationships, cope with challenges and use emotional information in an effective and meaningful way. 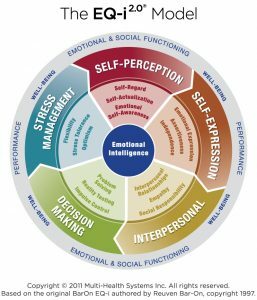 The EQ-i 2.0 is the world's leading assessment tool used for assessing emotional and social intelligence and an excellent way to understand the emotional competencies of an individual. It provides you with a picture of how you operate emotionally, your areas of strength and potential areas for development. A multi-rater EQ 360 is also available. While the EQ-i 2.0 identifies the level of a client's emotional and social functioning based on his or her responses, the EQ 360 assessment provides a more in-depth analysis by having those who work with the client provide information as well. When observer ratings are compared with the results of an EQ-i 2.0 self-report, a more complete 360 degree profile emerges. "How leaders use their power and whether they can effectively manage the authority of their role is one of the most critical factors in the success of an organization" (Julie Diamond). The realities of chaos in todays world calls for a healthy use of power for courageous leadership. Engagement increases because leaders know how to create conditions for people to do meaningful work. There's more psychological safety - people feel safe to speak up, ask great questions, and contribute their ideas freely. The workplace becomes more inclusive, respectful, and fair for all. If your work is to help leaders and their organizations thrive, it's vital you understand how their use of power impacts culture. Optimize your leadership by targeting critical opportunities and vulnerabilities related to how you use your power – personally and professionally. Using power effectively is a learnable competency. Strengths Quest is designed to help students identify and leverage their strengths. Using the Clifton Strengths assessment, students transform the way they experience college and university, to achieve success in academics, career and life. Students learn to be more engaged, and thrive while on campus, and beyond. We all have a preferred style of working and leading. Leverage the power and effective use of people styles at work ... and beyond, based on a model of four leadership styles developed by Bolton & Bolton in People Styles at Work (1996). Focused on behaviour rather than personality, the People Styles Assessment is based on other people's perceptions of you, not on how you see yourself. The people styles include: Analytical, Driver, Amiable, and Expressive, measuring the degree of assertiveness and responsiveness. Leverage your strengths and values of your style and others, especially if you work in teams. Once you know your style, learn how to flex to other styles for effective teams. My coaching is driven by the latest research in the neuroscience of human development, consciousness and effectiveness. I provide tools and a road map to better understand the brain and executive functions, change, learning and stress management and resilience. Reveal what gets in your way of success. Identify your inner critics, saboteurs and triggers. Apply the Seven Levels of Effectiveness™ and other neuroscience tools to better understand what’s happening in your brain and body under different circumstances. Coaching & facilitation of 2 or more people. Based on Relationship Systems Intelligence™ (RSI), ORSC is an advanced and courageous way of approaching leadership and team interactions. The basic principle of RSI is the redirection of focus from the individuals within the system, to the whole system as an entity in itself. In comparison to Emotional Intelligence (knowing me) and Social Intelligence (knowing you and me), RSI focuses on the relationship entity that exists among the humans in that system (knowing “it” or the relationship itself). This RSI principle moves leaders from working with aggregates of individuals to a holistic systems approach, increasing Collective Intelligence, and enhancing overall team performance. Bringing our deepest selves to conflict and disagreements. Groups and individuals get stuck in their development and need new information to break through unproductive patterns to organize at higher levels of awareness. The principles of Deep Democracy help us learn more about ourselves, and others by valuing all voices, especially the unpopular and hidden ones as change happens from the margins. Contact me for an assessment of your needs. In her twenties, Indy experienced a series of major transitions that would change the course of her life: the end of a significant relationship, the move to a new home, and living on her own for the first time. She began to ask herself a number of questions, including: Who do I want to be? What life do I want to live? and How do I want to live it? This initiated a journey of discovery that would eventually lead to her heart’s longing. But that was several years to come. In 2002, she was introduced to the concept of coaching and was immediately intrigued. She thought of it often, but the practical realities of life kept her focus on her day job and (what seemed like) the responsible choices to make. But in 2008, thirsty for new ideas and knowledge, Indy eventually followed her curiosity and took the training to become a Certified Executive Coach. She continued her nine-to-five job, and in her spare time, began laying the groundwork for a side business in coaching – which nourished and inspired her deeply. This work soon gained a life of its own. Within the walls of the organization where she worked, she felt caught between organizational directives and her own intuitive wisdom. The old dilemma that spurred her into action as a child resurfaced. Allowing herself to explore a new direction, and new questions, lead to her next major task. In 2011, Indy heard about a one-year contract in Toronto. Through a multitude of unexplainable signs, messages and synchronous events, Indy received the confirmation she needed. On an intuitive level, Toronto felt right, and very quickly, all the pieces fell into place. It was a huge risk to move across the country, but this New Beginning was a welcomed change. The new job was exciting, enriching, and offered a much-needed challenge. On all fronts, Indy was dealing with change – new job, new home, new social circle, new city. Underestimating the culture shock these multiple, overlapping changes would create for her, a whole set of demands, stresses, and constrictions surfaced, resulting in illness. About six months into her new job, Indy came down with the Shingles, which then led to adrenal fatigue and a compromised immune system. For the next several months, she worked to juggle a demanding job with maintaining some semblance of health and taking in the messages her body was telling her. At the end of her contract, Indy made the only decision she felt she could make: to pause, reflect, and tap into an inner source for her next steps. Away from the structures and systems guiding her career to that point, Indy gained perspective and reconnected to the questions that inspired her most – the very ones that initiated her journey in the first place. Taking the time to envision work on her own terms and without distractions, a deeper creativity, passion and purpose began to emerge. Many of us experience not fitting in – in our families, school systems, workplaces, or society in general. We live on the edges and struggle to find acceptance and love as we pursue our dreams. Indy’s work is about engaging people from that place and focusing on a paradigm shift: global peace, inclusion, living a creative life, and being an engaged, valued citizen. She is re-creating work, guided by the wisdom of her own authority. Indy continues on a path of personal discovery, stretching herself beyond her comfort zone, allowing her imperfections, examining her assumptions, and bringing her inner Rebel together with a profound curiosity about human development and her many years experience in diversity and inclusion. Through coaching, teaching and training, she works at the intersections of diversity, feminine energy, spiritual practice, and social and institutional change. She helps people question their biases, break out of their comfort zone, step through unknown doorways, and begin the journey home. Services include half or full day workshops to engage groups for collective learning, renewed energy, reconnecting with purpose and passion, fueling intentions, identifying actions going forward, and inspired visioning. Participants gain new perspectives, knowledge, skills and mindsets. While inclusion efforts are important they aren’t enough to bring about the level of shift required in today's world. For transformative outcomes, we need to consider equity and justice for sustained institutional change. Diversity & Inclusion efforts result in little systemic or transformative change in organizations. Workshops are designed to move the needle … from evolution (Diversity & Inclusion) to revolution (Equity & Justice). Social change models and theories are integrated to address bias, emotional intelligence, and a conscious use of power. The values embraced focus on relationship, compassion, and mindfulness. According to Dr. Dafina-Lazarus Stewart, for real change, we need to ask fundamentally different questions to address fundamentally different issues, to achieve fundamentally transformative outcomes. Transformational leaders make equity and justice the yardstick by which to measure progress (Dafina-Lazarus Stewart). This means stepping into courageous leadership to transform power in our selves, others and organizations. This requires emotional intelligence, mindfulness and authenticity. It also requires a focus on WHO you are - innovative, out of the box ways of BEING, a healthy use of power, humility and vulnerability. Transition requires navigating the internal challenges, and process, of change. This requires understanding the neuroscience of change, and how to re-wire the brain for sustained change. We achieve this by addressing limiting beliefs and mindsets and our inner critics and saboteurs to get unstuck from fear and old patterns. It also means embracing and acknowledging the emotions that come with the transition aspects of change. Stress and burnout are on the increase in many aspects of todays society. Is your passion for your work making you sick? Are you on the verge of burnout? Reclaim the lost art of rest, caring for self and the collective. Learn how to shift from reactivity to responsiveness and resourcefulness using trauma informed healing strategies. Apply mindfulness to leverage your energy, gain clarity and focus. The human soul doesn't want to be advised, fixed or saved (Parker Palmer). We are not broken or less than. We simply want to be witnessed, to be seen, heard, understood and respected. Coaching is a powerful tool for change, human development, and transformation. I provide structure, support, and accountability to work through the change process. I integrate and apply neuroscience tools to this process, plus grounding in equity & justice and an understanding of conscious use of power. Together we co-create potential for permanent, sustained change and growth. Coaching provides an opportunity to pause, reflect and connect to your inner knowing and wisdom. From this place I support you to clear that which gets in your way so that you have clarity to make decisions about change. Individual Leadership Coaching: Work with me one-on-one. I partner with you to support your radical stretch goals. We need leaders who are courageous in slowing down to reflect, notice and redesign their approach, to shift from reactive to responsive, from disconnected to connected to humanity. Together, we work through blindspots, shift limiting beliefs and take your leadership to the next level. And yes, YOU ARE A LEADER! Leadership is not a position, but a behaviour. Leadership is what happens when people step up to make a difference for what matters most, and what they they care about - whether or not they have positional power or expertise. Therefore, we are all leaders! Group Coaching: Participants from diverse backgrounds and interests sign up to address a common topic of interest to work towards their individual goals. As the coach, I provide a process to help clarify purpose, with each participant committing to the the actions necessary to reach their goals and complete their mission. In the process, they tap into the collective energy, experience and wisdom that are held within the group. Organizational Coaching: Applying the philosophy of Organization Relationship and Systems Coaching (ORSC), I work with 2 or more people. The focus is on the relationship that forms between individuals in a pair, team or group, rather than on working with the individuals.The relationship, or the system that is created between individuals, is the client. Think 'The Beatles' rather than the individual band members. As a Certified Neuro-Transformational Coach, I understand how our brains and bodies work under varying conditions. This knowledge is integrated into all my work - as a coach, a facilitator and consultant. • Coaching helps create positive new neural pathways, leading to lasting sustainable change. • Coaching and being “coach-like” tends to put people in a state where their brains are more open to learning, visioning, and growth. • The tools of professional coaching have been scientifically proven to reduce stress, leading to more sophisticated thinking, emotional intelligence, empathy, and creativity. • Coaching helps build crucial connections between various parts of the brain. A well-integrated brain is correlated with more success in leadership and life.